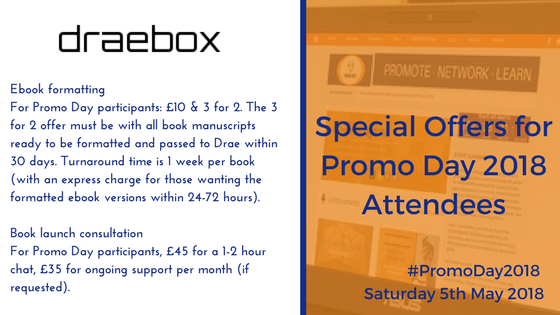 Drae Box has offered to give special discounts for Promo Day 2018 attendees on her Ebook formatting, and Book launch services. The discount code will be shared in the forums during the event and is needed to claim your discount. For the Promo Day participants: £10 & 3 for 2. The 3 for 2 offer must be with all book manuscripts ready to be formatted and passed to Drae within 30 days. Turnaround time is 1 week per book (with an express charge for those wanting the formatted ebook versions within 24-72 hours). 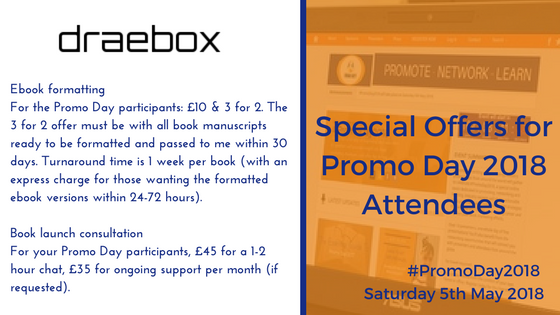 For Promo Day participants, £45 for a 1-2 hour chat, £35 ​for ongoing support per month (if requested). REGISTER NOW for access to the Promo Day 2018 event.